All classes and events are posted on Dance Refresh Repeat on Facebook. Imagine … a dance floor full of people. Folks of all shapes, sizes and physical abilities discovering their own sense of dance through simple rhythmic movements. A gathering of beings, getting down and grooving to every musical genre imaginable. A collection of souls, each with his or her own unique story to tell, having fun and being themselves in the moment, tapping in to the fullness of their human potential. This is dancing mindfulness. Classes and events are tailored for the general public and special groups. Classes can also be crafted for special events, retreats, etc. Dancing Mindfulness classes are open to everyone regardless of previous experience with dance, yoga, music, meditation, or spiritual practice, even though Dancing Mindfulness incorporates all of these elements. Since Dancing Mindfulness focuses on “coming as you are,” self-discovery, and noticing whatever may happen as part of the experience, it is imperative that classes are crafted to welcome everyone. 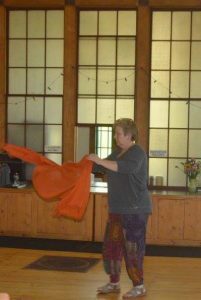 Dancing Mindfulness classes range from 45 minutes to 2 hours, depending on the venue of and purpose for the class, and various forms of music are incorporated to create a welcoming, integrated container. In a typical Dancing Mindfulness class, participants will be able to realize the rhythmic qualities of their breathing and heartbeats, to discover the healing, lyrical properties in even the most simple movements, and quite literally, to be able to express their own, personal story on the dance floor. If you are the kind of person who likes to dance like no one is watching, or at least would like to try, the Dancing Mindfulness experience is for you!